Seventeen days early at Broadway Post Office in Cardiff. Fifty of the Pub Sign "The Cross Keys" 42p stamps were bought on Saturday 26th July 2003 by Keith Hudson of Taplas folk magazine to use with 4p stamps to make up the 46p rate for second class postage on items up to 150gms. He would have bought more of the 42p but they had run out of 4p stamps to make up the rate and had to make it up in other ways. 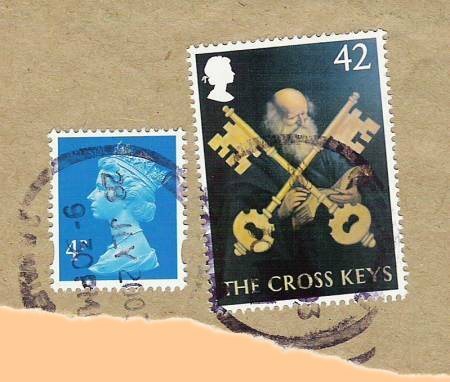 The stamps were used on Monday 28th July 2003 to mail fifty subscription copies of the magazine. The scan above shows a piece of an envelope that one of the subscribers had torn off and put aside for charity which I was able, with the help of Keith Hudson of Taplas, to recover. The piece has rather indistinct postmarks but on the mark that cancels the stamp the year 2003 can plainly be seen and the other mark shows 28th July 200! and part of what can only be a 3. 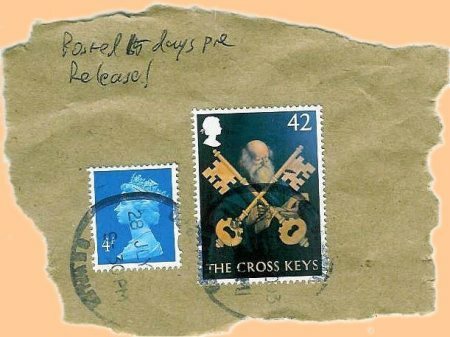 At least one other has survived that was posted to a First Day Cover collector who initially thought he had missed the issue of the set and had also torn off the stamp for charity. This piece also has indistinct postmarks and thanks to Paul Seligman is shown below. The Pub Signs issue of five stamps is Britain's contribution to this year's Europa theme of "Poster Art" and are officially released by Royal Mail on Tuesday the 12th August 2003.